Croz is back, again. 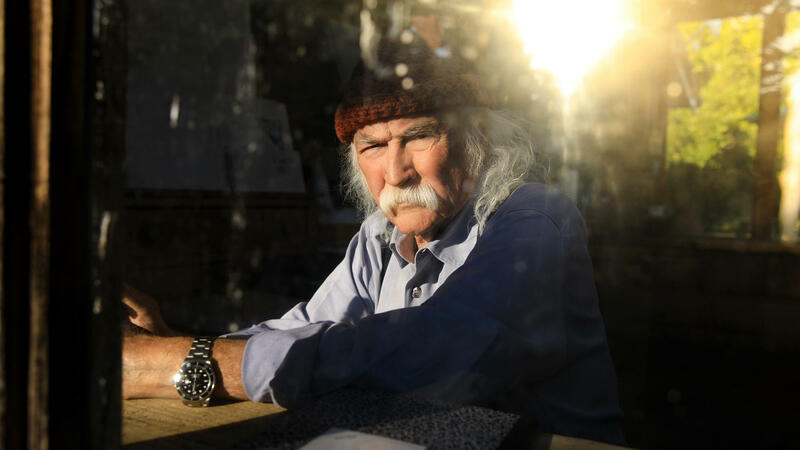 Singer-songwriter David Crosby releases his seventh solo album, Here If You Listen later this month on Oct. 26. It's his fourth solo album in five years and continues an active, prolific creative streak for the legendary Rock & Roll Hall of Famer. Crosby once again works with the three musicians who helped craft his 2016 album, Lighthouse, and toured with him in support of the album; Michael League of Snarky Puppy, Michelle Willis and Becca Stevens. Here If You Listen is a fully collaborative effort with all four artists trading off lead vocals and contributing songwriting to the album. With music written by Becca Stevens and lyrics by all members, Crosby's vocals on "Vagrants Of Venice," wondrously capture his rich, classic timbre. Over a hypnotic guitar line, sparse, haunting instrumentation and Crosby's lead vocals, all four members' harmonies wrap around each other with exquisite nuance, bringing the song to a magical climax. Listen to the new track premiered by WXPN. Beginning in November, Crosby and the band will be out on tour in support of the album. Nov. 2 - Neptune Theatre, Seattle, Wash.
Nov. 4 - Aladdin Theatre, Portland, Ore.
Nov. 6 - Castro Theatre, San Francisco, Calif.
Nov. 8 - Lobero Theatre, Santa Barbara, Calif.
Nov. 9 - Golden State Theatre, Monterey, Calif.
Nov. 10 - Fred Kavli Theatre, Thousand Oaks, Calif.
Nov. 12 - Balboa Theatre, San Diego, Calif.
Nov. 13 - City National Grove, Anaheim, Calif.
Nov. 15 - National Hispanic Cultural Centre, Albuquerque, N.M.
Nov. 17 - Liberty Hall, Lawrence, Kan.
Nov. 19 - North Shore Centre for the Performing Arts, Skokie, Ill.
Nov. 20 - Capitol Theatre, Madison, Wis.
Nov. 25 - Kalamazoo State Theatre, Kalamazoo, Mich.
Nov. 29 - Weinberg Center for the Arts, Frederick, Md. Dec. 1 - The Egg Performing Arts Centre, Albany, N.Y.
Dec. 2 - Whitaker Centre for Science and the Arts Sunoco Performance Theatre, Harrisburg, Penn. Dec. 4 - Tupelo Music Hall, Derry, N.H.
Dec. 5 - Bergen Performing Arts Centre, Englewood, N.J.
Dec. 7 - Zeiterion Performing Arts Centre, New Bedford, Mass. Dec. 8 - Capitol Theatre, Port Chester, N.Y. Here If You Listen is out on Oct. 26 on BMG.